Screenprints on Stonehenge paper, 22” x 30” each. 27 1/2” x 35 3/4" framed. Printed at Artists Image Resource, Pittsburgh. (Re)setting Sights suggests just that — a reconsideration of our targets, both metaphorical and real. The work speaks to both domestic violence and gun violence, painful issues that have plagued our country over numerous election cycles including this one. The pillow is an object of domestic comfort. In bed or in our homes, where we are our most intimate and vulnerable selves, we should be safe. But in the USA, 1 in 3 women and 1 in 4 men have been victimized by physical violence by an intimate partner within their lifetimes. And, on average, 297 people in America are shot every day in murders, assaults, suicides & suicide attempts, unintentional shootings, and police interventions. I wish that our aim would inspire rather than inflict—and nurture rather than annihilate. In layering several modes of representation, "(Re)setting Sights" injects doubts about its own claims. Artifice lies upon artifice. 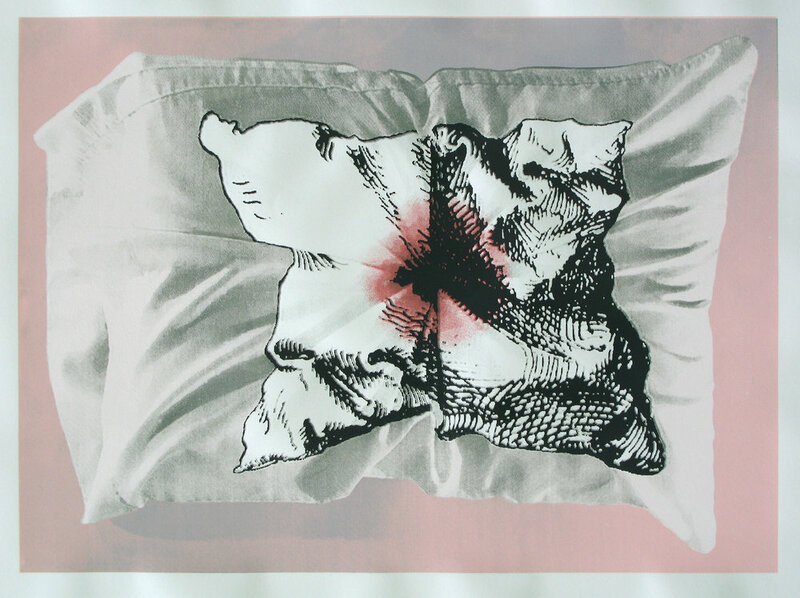 The image borrows hand-drawn observations etched by Albrecht Durer, which were then photographed and screened onto real pillowcases, slipped over real pillows and then subjected to a simulated impact of a punch or bullet. They were then re-photographed and digitally manipulated. 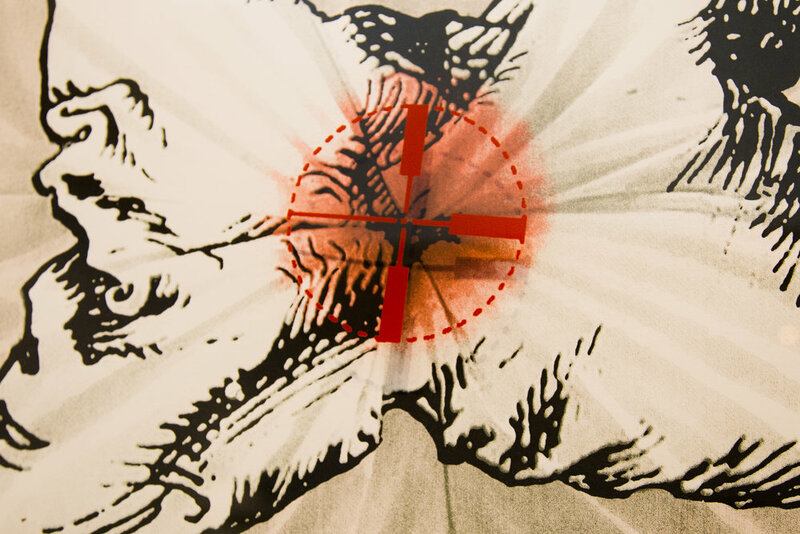 When framed, a gun reticle is printed on the glass that hovers above the print. In one print, an actual bullet pierces the glass. Perhaps these multiple and contradictory deceptions, like double negatives, can convert to a positive recalibration or refocus of our individual and collective aims. Screenprint on Stonehenge. 22 x 30 inches. Screenprint on Stonehenge, 22 x 30 inches. Detail of bullet piercing plexiglass of frame. Oil and acrylic on 15 circular panels, 68 x 40 inches installed. ROMANTIC RESISTANCE addresses violence on the domestic front, and violence that confuses instincts regarding pain and pleasure. A necklace of pearls, representing beauty born of pain, remains coherent despite the gaps in its arrangement. The strand persists despite the bullet holes that pierce each panel. 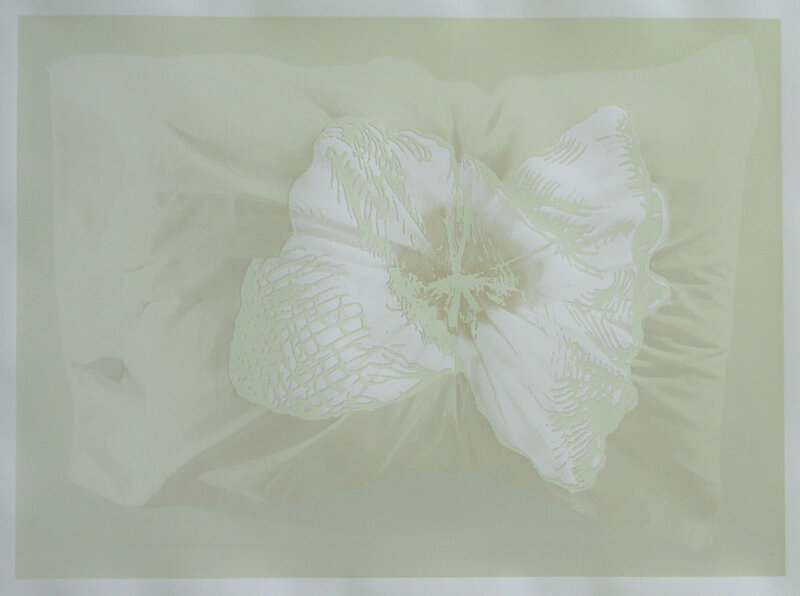 This series, based on Albrecht Dürer's Six Studies of Pillows, extends a body of work that portrays mattresses, pillows or cushions, typically soft (and by association, female) objects and sites that are both functional and sentimental. The respite they normally provide is disrupted through bifurcation, punctures, amputations and other acts infused with ideological zealotry, violent, or amorous passion. Hand-colored etching, mixed media, 11.5 x 8.5 inches imprint.